Following the success of "The Grinch" autistic special needs morning matinee in December, Marquee Pullman, Huntington; Marquee Galleria, Beckley; Marquee Southridge (Charleston); Marquee Highlands (Wheeling); Marquee Wytheville 8 (Wytheville, Va) will kick off a monthly series devoted to families that have members with special needs. 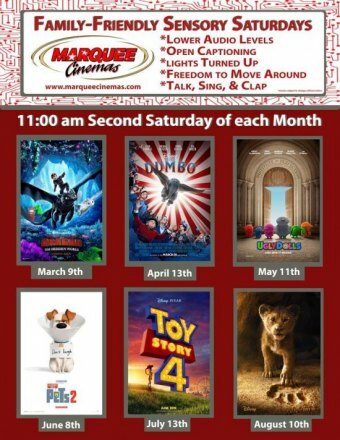 The sensory friendly screenings will be the second Saturday of each month at 11 a.m. at the listed multiplexes. To accommodate conditions such as autism, the auditorium lights are not completely dimmed, the volume will be lowered, outside snacks for special diets are allowed, and no one complains about utterances or moving about.